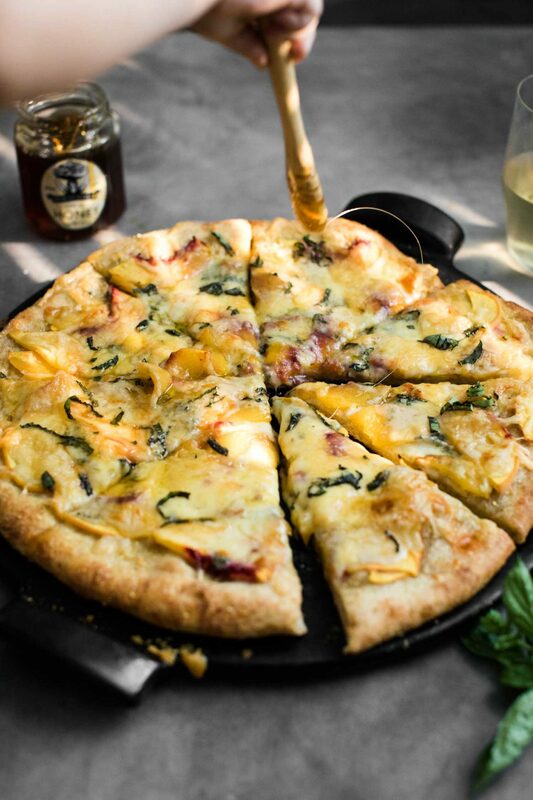 Blue Cheese Peach Pizza with Honey | Naturally. There are combinations that might feel a bit over-done but I will always (and gladly) eat. One of those combinations: blue cheese and peaches. Fresh, sweet peaches paired with the earthy flavor of blue cheese is everything I could want in one bite. Add it to pizza and drizzle it with honey; I’ll probably eat the whole thing. For this peach pizza, I was lucky enough to source some amazing local honey, c/o Nugget Markets. Nugget’s Fresh to Market brand sources from many local companies and their honey comes from Pure Honey based in Winters, CA. I took a drive out to visit and left with even more of an appreciation for the honey (and the bees). The honey Nugget sources is raw honey which means all the good stuff is left in the honey. 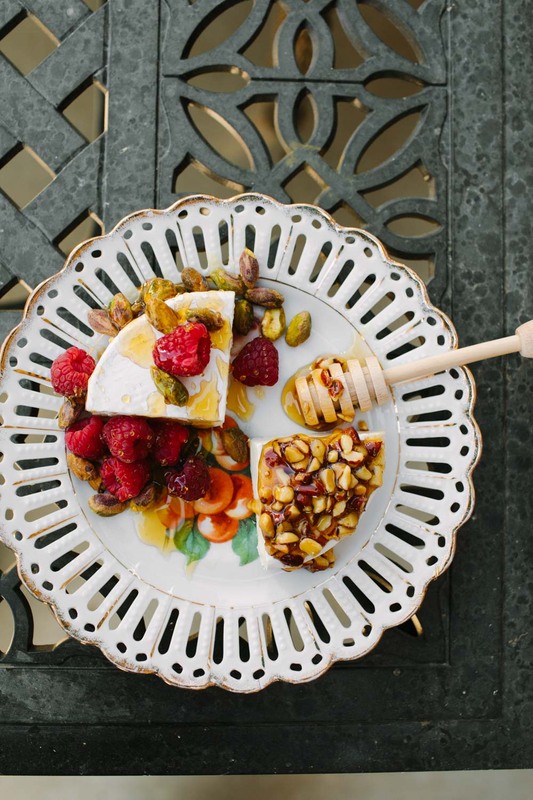 One note, which came directly from Doneice of Pure honey: Crystallization is a natural part of raw honey and the easiest way to get the honey soft: set it outside on a warm day. Grilled Cheese: I’m so in love with the peach/blue cheese/honey flavor that sometimes when I make myself lunch, I’ll add this combination to a grilled cheese sandwich. It’s such a perfect slightly sweet/slightly savory lunch. Pears: This time of year is great for stone fruit but it’s also pear season! Swap the slices of peaches for pears. Cheese: I know blue cheese isn’t for everyone. 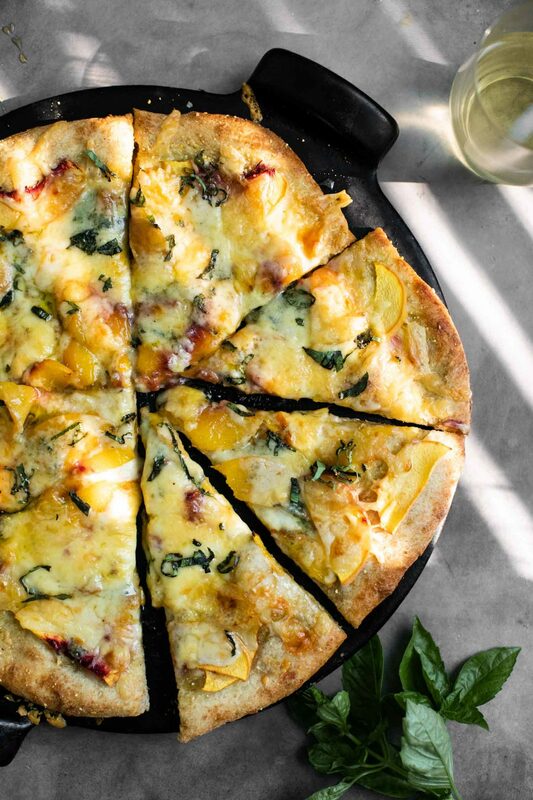 Try goat cheese or you could do mozzarella only on this peach pizza. Nugget asked me to help highlight one of their local makers and I’m so glad I chose honey. The honey Nugget sources comes from a family operation of bees and honey. 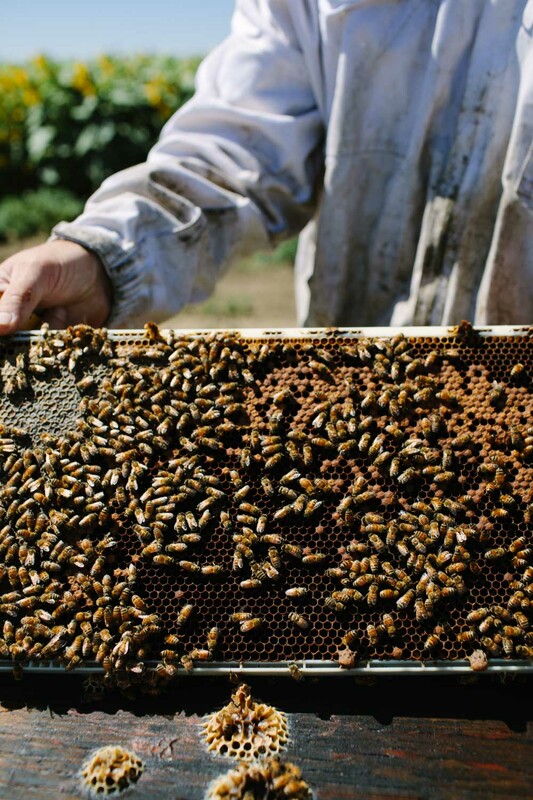 The bees are well-cared for and maintained through sustainable practices. I love the honey on our morning oatmeal, nut-butter sandwiches, and of course, this pizza. Heat your oven to 475˚F with a pizza stone. Heat olive oil in a small skillet. Add the garlic and fry until the garlic is golden. Remove from heat and let rest until ready to use. Before using, remove garlic. Prepare the pizza topping. Thinly slice the peaches and grate the mozzarella cheese. On a good non-stick surface (like a pizza peel sprinkled with cornmeal), stretch and roll the dough into a circle roughly 12 to 14” in size. 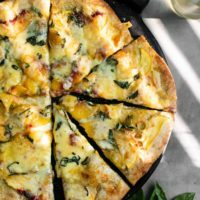 Spread the garlic-infused olive oil over the pizza dough then layer with the thinly sliced peaches, grated mozzarella cheese, and crumbled blue cheese. 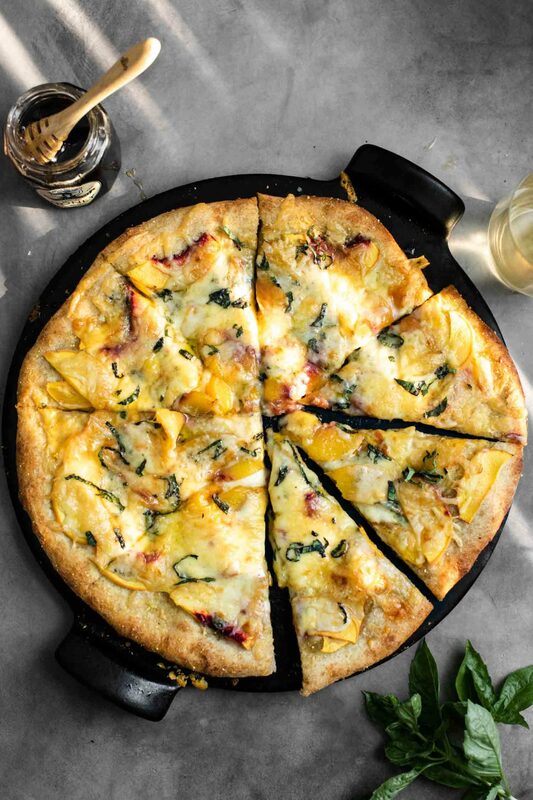 Transfer the pizza to a pizza stone and bake until the cheese has melted and the crust is golden. 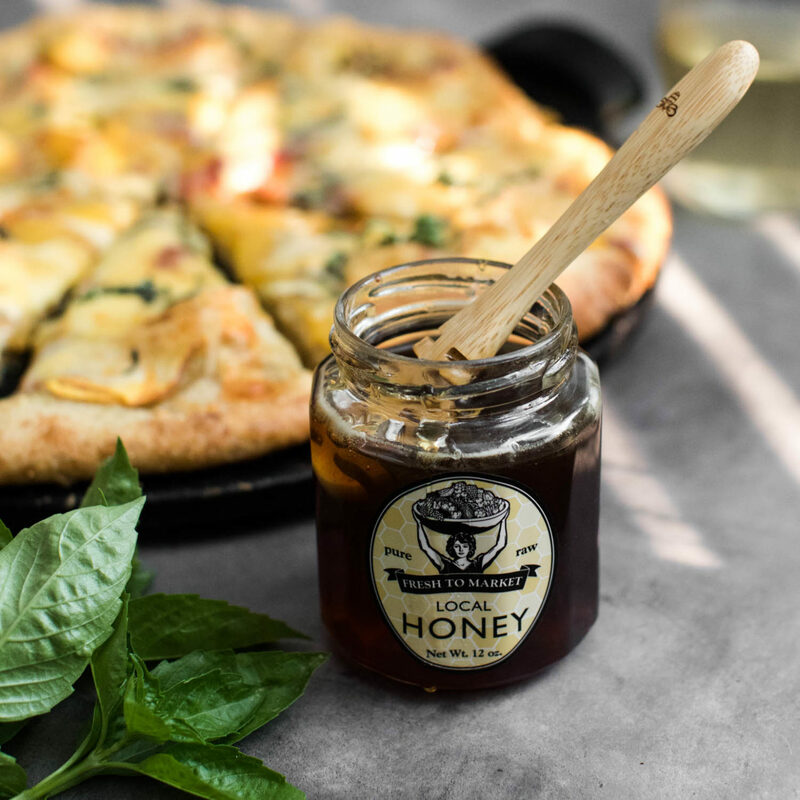 Remove the pizza from the oven and drizzle with honey and sprinkle with julienned basil.